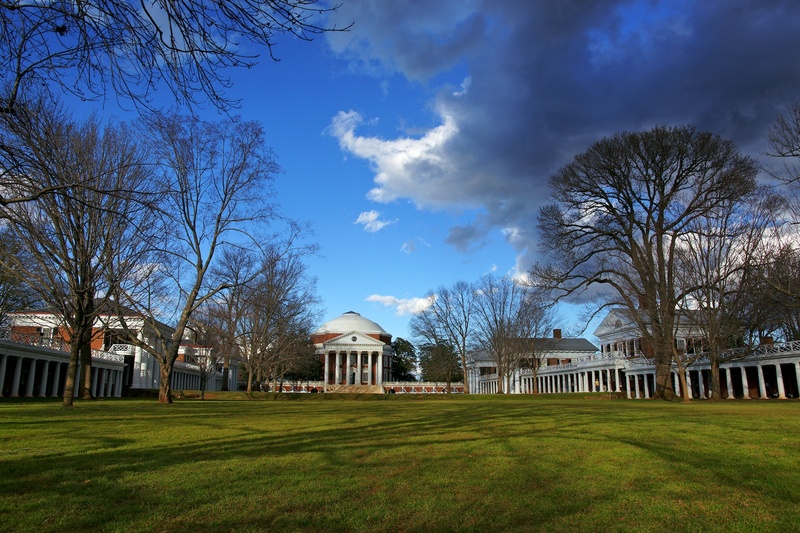 HAPPY ANNIVERSARY: The University of Virginia begins the official commemoration of its 200th anniversary on Friday, October 6, when some 20,000 people are expected to gather for a Bicentennial Launch Celebration on the Lawn. That event will mark the 200th anniversary of the laying of the University’s cornerstone at Pavilion VII on the Lawn, the centerpiece of the Thomas Jefferson-designed University Grounds. Thomas Jefferson had begun planning what he called his “academical village” several years earlier. He already had plans in mind when, in 1716, the Virginia General Assembly granted a charter for what was then known as Central College in Albemarle County. Jefferson was elected to the school’s Board of Visitors. The following year the Board met for the first time and chose a location for the College. Then, on October 6, 1717, masons laid the foundation for the college, which became known as The University of Virginia the following year. Construction of the buildings on the Grounds (which is not called a “campus”) went on for the next eight years. That included the Lawns’ ten pavilions, which were designed to be professors’ residences and lecture halls, and today house the University’s top students and faculty members and their families. The Grounds—and Monticello—are UNESCO World Heritage Sites, and the Rotunda is a U.S. National Historic Landmark District. Events throughout the weekend will commemorate many aspects of the University’s founding. There will be lectures, exhibits, concerts, and the dedication of a Memorial to Enslaved Laborers (artist’s rendition, below). It will commemorate the contributions of the enslaved people who did most of the heavy lifting work two centuries ago. THE BEAST: An article posted October 1 on the Daily Beast web site tells a story familiar to anyone who has read Saving Monticello. 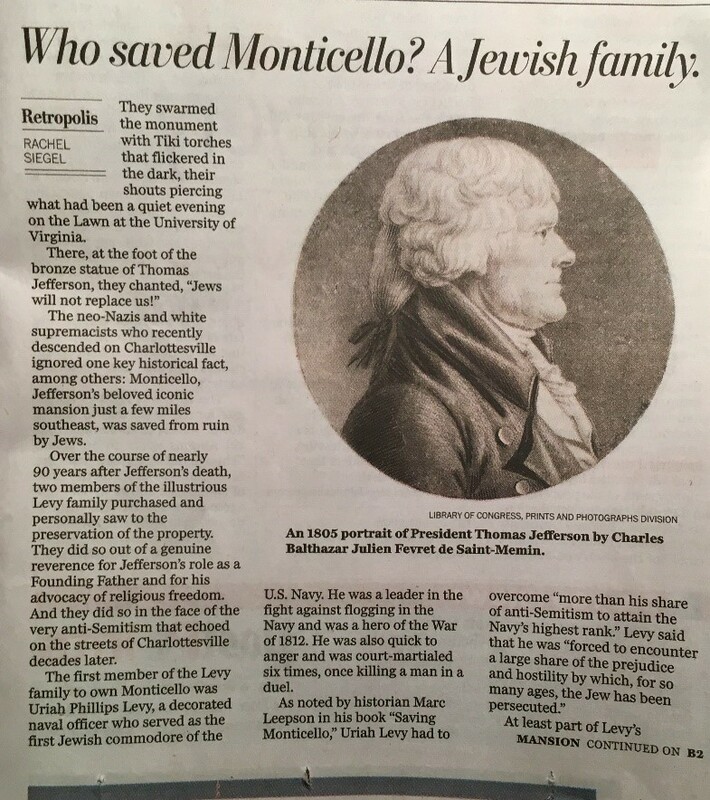 Entitled “How America’s First Jewish Commodore Saved Monticello,” the article by McGill University history professor Gil Troy lightly goes over the life of Uriah Phillips Levy, highlighting the anti-Semitism he faced in the U.S. Navy, along with his stewardship of Thomas Jefferson’s Monticello. Professor Troy did not contact me for his article. He borrowed from the WP piece, as well as from other good sources, including Saving Monticello, which is not mentioned in the body of the article—although it is listed at the end of the article “for further reading,” along with the untrustworthy 1963 UPL bio, Navy Maverick by Donovan Fitzpatrick and Saul Saphire. The Daily Beast article was mainly accurate, although I take exception to Troy’s claim that Uriah Levy “remains unknown.” Just Google his name and you’ll see how un-unknown he is. Other missteps: Troy repeats the unproven story the UPL came back from his stint as a ship’s cabin boy at age thirteen “to be bar mitzvahed.” That’s an all-but-certain made-up tale told in Navy Maverick. That book is also the source for the misinformation that Troy repeats that UPL was held at “brutal Dartmoor prison” after his ship was sunk in the English Channel during the War of 1812. Ira Dye proved that Levy never was held in Dartmoor while doing the research for his excellent 2006 military biography, Uriah Levy: Reformer of the Antebellum Navy. Also, Uriah Levy was not court-martialed in 1816, as Troy writes, after killing another Navy officer in a duel. Since the duel in question took place off ship, Levy was tried in a Philadelphia County Court—not in a military court martial—and found not guilty. Also, in 1857 Levy wasn’t “barred from the Navy,” as Troy says. He was riffed, along with a good number of other officers. Also, a letter Levy allegedly wrote quoted in Navy Maverick that Troy cites—that UPL admired Thomas Jefferson because he did so “much to mold our Republic in a form in which a man’s religion does not make him ineligible for political or governmental life”—has never been found. 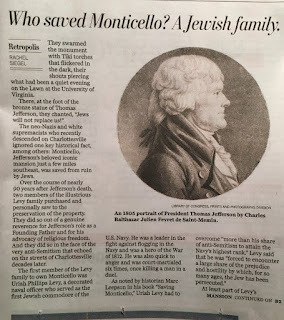 As I wrote in an endnote in Saving Monticello, those words are the only words attributed to Uriah Levy about his thoughts about Thomas Jefferson and are almost too good to be true. In Navy Maverick Fitzpatrick and Saphire provided no information about the whereabouts of the letter, nor did they give the letter’s exact date. Attempts by myself, Ira Dye, and other researchers to find the letter have been to no avail. 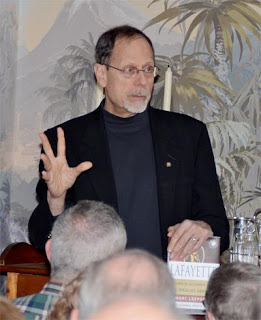 · Sunday, October 22 – 2:00 p.m. talk on Saving Monticello and book signing for the Fauquier County (Va.) Public Library at the John Parton Payne Building, 2 Courthouse Square, Warrenton, Virginia. Free and open to the public. · Tuesday, October 26 – 6:30 p.m talk on Ballad of the Green Beret and book signing. At the Montclair Community Library, 5049 Waterway Dr., Dumfries, Va. Free and open to the public. For more info, call 703-792-8749. GIFT IDEAS: If you would like a personally autographed, brand-new paperback copy of Saving Monticello, e-mail me at Marc527psc@aol.com I also have a few as-new, unopened hardcover copies. Or go to marcleepson.com/signedbooks.html to order copies through my local bookstore, Second Chapter Books in Middleburg, Virginia. We also have copies of Desperate Engagement, Flag, Lafayette, and What So Proudly We Hailed, and Ballad of the Green Beret.